Understanding the need to design for extreme affordability is giving birth to a new generation of entrepreneurs. These are entrepreneurs with a social conscience who are motivated by the desire to do good and do well at the same time. They are finding new ways to empower the poor by satisfying their basic needs for safe water and electricity in emerging markets. According to Wikipedia definition, a social entrepreneur is someone who recognizes a social problem and uses entrepreneurial principles to organize, create, and manage a venture to make social change. Unlike a business entrepreneur who typically measures performance in profit and return, a social entrepreneur assesses success in terms of the impact s/he has on society. While social entrepreneurs often work through nonprofits and citizen groups, many work in the private and governmental sectors. In addition to their inner desire to help others while also helping themselves, what has encouraged such entrepreneurs is the successful penetration of the mobile phones among the poor in India and Pakistan, many of whom subsist on less than a dollar a day. The rapid growth of cell phones among the rural poor in South Asia has shown that even the poorest of the poor are willing to offer several months' earnings for the benefit of connectivity. By doing so, they have demonstrated their potential as consumers of affordable products that offer them real benefits, such as a glass of safe drinking water and a bright source of light at night. Saafwater, Inc. is a startup helping people in Karachi, Pakistan with access to safe drinking water. The company founders, Sarah Bird, Saira Khwaja and Khalid Saiduddin, emerged as finalists in Massachusetts Institute of Technology’s 100k Entrepreneurship Competition in 2007, and received $10,000 to put the concept of SaafWater into practice. The company's first product is SaafWater Daily Capsule - a simple capsule of chlorine solution that can treat one family’s daily supply of drinking water. SaafWater’s mission is to provide affordable clean water to low-income communities in urban areas. Their goal is to create a profitable distribution network that can supply billions of people with clean water. The company has worked closely with the US Centers for Disease Control’s Safe Water System which has been responsible for pioneering this technology and reaching an estimated 16 million users worldwide. With their help the company has learned from their experiences and to ensure that it meets all the relevant World Health Organization Guidelines for Drinking Water Quality. Going door-to-door, SaafWater representatives sell daily chlorine capsules, which can be immersed in a family’s water container rendering the supply free of contaminants in 30 minutes. Sales representatives offer a week’s supply for about 30 rupees, the rough equivalent of U.S. 40 cents. SaafWater also plans to launch independent programs with existing NGOs to help create self-sustaining water purification programs throughout Pakistan. Saafwater's vision is to build and extend this network to include many other life-saving and life-enhancing products such as clean-burning fuels, sanitation, renewable electricity, refrigeration, eye-glasses, multi-vitamins for mothers and children, and construction materials to name but a few. D.light, founded by two Stanford graduates, marries next-generation light-emitting diodes (LEDs), proprietary power-management tools, and increasingly cheap solar panels. The founders, Nedjip Tozun and Sam Goldman, attended Professor Jim Patell's Stanford Business School class called Entrepreneurial Design for Extreme Affordability, highlighted recently by Fortune Magazine. As a result, D.light is able to offer poor communities an affordable alternative to kerosene, which is ubiquitous but hazardous. The quality of the kerosene lamp light isn't good, it emits pollutants, and it's just plain dangerous. "You travel around these villages, and everyone has a story of a child being burned or a house destroyed by fire," says Tozun, speaking to Fortune by phone from his office in Shenzhen, China. "And yet in some places we found that people were spending 15% to 20% of their income on light." The world's poor spend about $38 billion a year on kerosene for lighting, according to the International Finance Corp. According to Fortune magazine, the D.light lamps sell for about $25, steep for someone earning $1 per day, but the D.light team quickly found that the quality of light was so good that people with the D.light lamps were able to do more work at night and increase their income. Two families in New Keringa, a village of 47 families in southern India, took the plunge on D.light lamps. Says Tozun: "All of a sudden the two families were able to work at night," mostly weaving banana leaves into plates. "Their average monthly income increased from $12 to $18, and they could save the time spent traveling to buy more kerosene." Within a few days the entire village had sprung for the lights. "These people are great customers if you give them a clear value proposition," Tozun says. In November, D.light raised $6 million in venture capital funding from Draper Fisher Jurvetson and Garage Technology Ventures, among other venture capital firms, to ramp up production and get its lamps into markets, initially in India and Africa. Empowering would-be customers is one of the mantras of Patell's class at Stanford. Each year some students, like Goldman and Tozun, take their ideas and try to build businesses. Patell doesn't expect every student to start a company, but he does demand that every product in the class offer poor consumers tools for their own microenterprises. "We want to design things so that a farmer can decide to leave his farm and support his family selling water pumps or drip-irrigation tubing," Patell says. "We want things to be sold at a price that covers the cost of manufacturing and distribution." The need and the opportunity for social entrepreneurs have never been greater. Both SaafWater and D.light are examples of what the institutions of higher learning can do to encourage such entrepreneurship catering to the needs of the billions of poor people in Africa, Latin America and South Asia who can potentially become a huge new lucrative market. What is needed is for the budding entrepreneurs to recognize such opportunities to offer highly useful and essential products at extremely affordable prices. Educational institutions in Pakistan and India can and should play a leading role to encourage and prepare them to do good and do well, and investors should open their minds to see the great opportunities that lie ahead for them to make good returns on such investments. Water and sanitation related diseases are responsible for 60% of the total number of child mortality cases in Pakistan, with diarrheal diseases causing deaths of 200,000 under-five years’ children, every year. So, the problem goes beyond water scarcity. Water safety is a huge issue, in Pak and many other developing nations. You are right in emphasizing the aspect of water sanitation. It is a two pronged beast. Water availability and water sanitation are both Pakistan's problems. In Bangladesh where water is abundant and freely available in most areas the main issue is that of water sanitation. I have spent a lot of time in Bangladesh and was back recently to study this issue of water sanitation. Chlorinating water to make it safe does help in lowering diseases but not by much. In my study I found that the fundamental things that have the most impact on the well being of a community and that bear lasting effetcs is personal hygiene, basic training in cleanliness and training in proper dsiposal of garbage. You know that it is very difficult to maintain personal hygiene without the availability of water. Water in a container may be chlorinated and safe to drink But if people cannot keep their hands and utensils clean they will keep infecting each other. There's no one silver bullet. The best way to solve the problem is to address each piece of it. When Pakistan has the highest infant mortality rate in South Asia (99 per 100,000) and diarrhea a known killer of about 200,000 children, one can not argue that clean water issue should not be addressed as a priority. Studies by US CDC involving 16m people in the dev world have shown the effectiveness of chlorine in fighting a lot of stomach ailments common in Pakistan. Poor sanitation is also a big issue. There is an example of another Pakistani social entrepreneur Akhtar Hamid Khan who has shown that the problem can be addressed by community based efforts. He did the Orangi Pilot Project, whose link I have included in my post, along with links to the issue of water scarcity. We would like to let you know that D.light Solar products are now available in Pakistan. You can contact us at info@taxila.com.pk for more information. We, Taxila Services, are the sole distributor and agent for d.light solar products in Pakistan. d.light offers a unique solar light solution that can potentially eliminate the use of kerosene lamps in Pakistan. For a complete overview of our products please visit http://www.dlightdesign.com/. d.light Design offers revolutionary power and light solutions that are affordable and energy-efficient. Using cutting-edge technology from Silicon Valley, d.light products provide safe and high-quality replacements for kerosene lanterns, emergency lamps as well as other hazardous or unreliable power sources. Through thousands of hours of field research and continuous contact with our customers, we have a deep understanding of our customers needs. An example is the tough durability of our products designed to accommodate heavy handling by our customers in highly variable climates. Our products are currently being sold in India and throughout Africa, with market tests ongoing around the world. Anyone who has seen the blockbuster film “Slumdog Millionaire” would remember the “potty scene” where the young Jamal is shown relieving himself in an open pit. The scene caused a lot of adverse reaction in India as unrepresentative of true India. But according to a joint study conducted by the World Health Organization and UNESCO, 665 million Indians, or nearly two-thirds of them defecate in the open. I am not sure if these 665 included people using indoor toilets without plumbing; if it did not, then the number of Indians defecating in an unhygienic manner is even greater. Dr. Pathak is an Indian social entrepreneur addressing India's sanitation crisis. He has founded a movement called “Sulabh International” and developed a simple, low-cost toilet which cost approximately Rs. 700 and could be installed anywhere, including villages without any plumbing. This toilet uses only 1.5 liters of water for flushing as against 10 liters by a conventional toilet. The toilet “system” consists of two pits: when the first one fills up, it is closed and the other one is used. The closed toilet dries up in two years when it is ready to be used as fertilizer and for conversion into biogas for heating, cooking, and generating electricity. In 2009, William Kamkwamba, a teenager from Malawi, made the rounds on American talk shows and coauthored a best-selling book. The source of his notoriety? A homemade windmill that provided power and running water for his family. Kamkwamba built it from trash, using an old textbook as his only guide. In the United States, the idea of deploying small-scale windmills had been abandoned as too expensive and horribly inefficient. In Malawi, a teenager had built one spending less money than the average American eighth-grader's weekly allowance. Kamkwamba's story points to an unrecognized truth of social entrepreneurship and innovation. The United States isn't a leader; it's a laggard. Consider some of the most important social innovations of the past 20 years. The modern microfinance industry was pioneered in Bangladesh and has spread to virtually every country in the world. The business model that allowed the near-universal penetration of cellular phones into poor communities was born in Bangladesh, as well. Meanwhile, two innovative ways to use cell phones' ubiquity in poor communities to change the world have emerged from Kenya: M-Pesa, a mobile-to-mobile money-transfer service, has become a model worldwide. And Ushahidi, a technology platform that relies on text messages to guide crisis response, became an important part of the rescue and recovery efforts in Haiti and Chile after the earthquakes there. It's currently being used to track the effects of the oil spill in the Gulf of Mexico. India is the home of world-class innovators like Aravind Eye Hospitals and the education-focused NGO Pratham. The latter has had such success that its teaching approach is being adopted in several African countries. Sure, there are examples of impressive and effective American social entrepreneurship. But, as these comparisons make clear, most world-changing innovations aren't coming from the United States. Why? Well, for one thing, we haven't figured out how to train entrepreneurs successfully. The rates of entrepreneurship (measured by self-employment and age of operating businesses) are lower in the United States than in most other countries (even OECD countries). Despite all the money poured into various entrepreneurship-training programs, the failure rate of U.S. entrepreneurs, social or otherwise, has held largely constant for decades. Ibrahim received a master's degree in economics, an MBA and a PhD in geopolitical strategy at Cambridge University. He is currently a research scholar at Harvard University's Kennedy School of Government, and has been named an "emerging global leader" by Yale University's World Fellows Program and an "ideas scholar" at the recent Aspen Ideas Festival. He also was a paratrooper in the British Army and speaks four languages --- English, Arabic, Punjabi and Urdu. Arabic Knowledge@Wharton: What did Pakistan's government ask you to do in terms of economic strategy? Azeem Ibrahim: My friend, Dr. Nadeem-Ul-Haq, who was a key economist at the International Monetary Fund (IMF), asked me to help him out. We were talking about setting up the first think tank in Pakistan, specifically to concentrate on economic development. We had a number of discussions about it before he left for Pakistan. A few days later, he called me [in May] and said, "Listen, I've just been appointed head of the Planning Commission and I'd like you to be a key adviser." We had a couple more discussions about it, and we thought the focus should be to encourage a more entrepreneurial and innovative environment in Pakistan. I thought I would give him some advice and that would be it, but what he had in mind was a little more ambitious. He said, "We have to write a whole new national economic strategy from a blank slate." Arabic Knowledge@Wharton: You mentioned in other interviews six main points you envision for Pakistan's economic recovery, including identifying people with business acumen. Can you expand on that point and tell me about the other points? Ibrahim: I believe entrepreneurs are people who have the imagination to recognize a new product, process or service, and possess the ability to make their ideas happen. Entrepreneurs, and the new businesses they create, are the engines of economic growth and job creation, which in turn underpin political stability and the growth of a civil society. To that end, we can identify experienced and potential entrepreneurs through schools, colleges, science and technology institutes, and civic organizations. We would seek entrepreneurs from "no-tech" and "low-tech" businesses, like agriculture, handicrafts and tourism, as well as high-tech businesses. We would work closely with development agencies, which have access to many "feeder" organizations to identify entrepreneurs. The second point is to train and encourage entrepreneurs through domestic and international programs, varying from two-week boot camps to multi-month immersion programs. 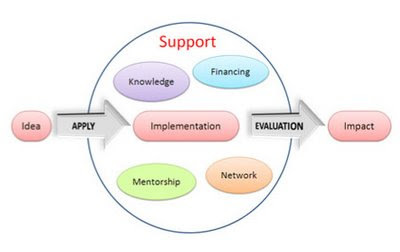 Third, we want to help develop networking, mentoring, incubation and acceleration programs. One example would be to establish an entrepreneur-in-residence program, which would include entrepreneurs from the diaspora who are familiar with Pakistani language, culture and business. Also, we'd like to establish a web-based backbone, with mentor-mentee matching as well as a contacts list for services, similar to Craigslist. Funding, of course, is important, and that is my fourth point. We want to engage private sources of finance to provide funding for start-up ventures, including the creation of angel investor networks. We want to find the best possible partners to mentor young entrepreneurs and help them develop funding strategies and learn how to make the best possible presentations to potential funders or investors. My fifth point is to combine diplomatic advocacy and foreign assistance to reform financial, legal, policy and regulatory impediments to private-sector development, and help entrepreneurs get access to early-stage capital. The fertile alluvium deposited by the mighty Indus river and its tributaries in Pakistan have given the country’s demographic heartland of Punjab an agrarian edge. Yet, errant canal planning and over-pumping from tube-wells have degraded vast tracts of land. Salinity and water-logging afflicts around 6.3 million hectares of land and an additional 4,000 hectare of land gets affected every year (estimates from University of Agriculture, Faisalabad, Pakistan, November 2011). Climate change and conflicts over hydroelectric impoundment infrastructure have also made the arable lands of the country further vulnerable to flooding, as we saw in the epic floods of 2010 when an estimated 20 million people were displaced. Amidst all these challenges to the farming economy of the country, there are glimmers of hope that Pakistan’s elite are trying to reconnect with the land in sincere and innovative ways. During my last trip to Lahore – the capital of Punjab province and Pakistan’s second-largest city (after Karachi), I was heartened to see urbanites retreating to farms in the surrounding countryside. Previously such farms were merely ornamental playgrounds of wealthy families but now there is a growing interest in these ranks to reconnect with the earth for societal good. Zacky Farms, just outside Lahore, is the brainchild of Zafar Khan, a Caltech-educated software engineer who runs one of the most successful information technology companies in Pakistan named Sofizar. What started off as a recreational venture is now a side-business supplying sustainably produced organic milk, vegetables and meat to nearby Lahore suburbs. The farm is modeled on a cyclical model of minimal wastes and multiple product usage. The cows are fed pesticide-free oats, clover and grass and their manure is used to fuela biogas plant which runs the dairy facility. In an era of electricity load-shedding, such an alternative source of energy at a local industrial scale is immensely valuable to replicate as a development path. The residue of the biogas is used to fertigate the fodder fields and vegetable tunnels, which along with green manuring obviates the use of fertilizers. Free-range chickens grace the fields and there is even a fish farm on site. Zafar and his Ukrainian-born wife are committed to sharing their experiences with other farming entrepreneurs in the country. ...Further south in a more rural and remote part of Punjab, famed writer and erstwhile lawyer, Daniyal Mueenudin, maintains a mid-size farm which is exemplifying other kinds of innovations. The farm does not boast ecological farming practices, apart from tunnel farming that can help with land conservation and humidity control. However, Daniyal has changed the social landscape of his area through implementing a “living wage” for all his employees. Noting the high level of inequality in Pakistan’s hinterland, the Yale-educated former director of the university’s Lowenstein Human Rights Clinic, is practicing what he preached. He also owns a farm in Wisconsin and could have a comfortable life in the States but his social obligations keep him ensconced in Pakistan for most of the year. Raising the wage several-fold for works and farm manager, and also offering bonus incentives for performance, has led to positive competition that can help to erode the feudal levels of income disparity which exist in this part of Pakistan. At the same time, Daniyal is also committed to providing new livelihood paths for the agrarian workers as automation reduces farm employment in some areas. He has has fully funded a school and provided a merit-based scholarship for advanced degrees to students from the nearby village. One of the children from this school (the first in his family to even go to school) is now making his way through medical school in Lahore! Zafar and Daniyal’s stories of commitment to constructive farming for social and ecological good may appear to be outliers but they are catching on and provide hope to a country which is all too often shadowed by despair. In the suburbs of Islamabad, tax incentives and planning rules to encourage farming by urbanites are leading to a growing culture of reconnecting with the land in residential farms. In rural areas, the disaster caused by the floods of 2010 brought forth numerous aid agencies with new ideas for sustainable farming. The Pakistani diaspora, often known in the West for professions ranging from taxi-driving to engineering, may well find opportunities for reconnecting to their land in far more literal ways. With growing commitment from land-owners it just might be possible to use the existential shock of recent natural disasters that have befallen the country into a proverbial opportunity for positive change. A cheap Australian-designed solar light is changing lives in developing nations, including 80,000 refugees in Pakistan still struggling to rebuild after the country suffered devastating floods a year ago. As we've reported before, the adverse effects caused by the estimated one billion people living off the grid in poor countries who use kerosene lamps for lighting often outweigh their benefits. Kerosene can account for a third of a family’s monthly income and toxic fumes from the lamps, which are often included in aid packages, can cause a number of illnesses. Soot and carbon dioxide created when burning kerosene also adds to the world's carbon emission woes. Recognising the problem, Melbourne inventor Shane Thatcher founded illumination Solar in 2010, and the Mandarin Ultra solar light was born. The Mandarin Ultra can provide up to four times more light than a kerosene lamp from 12 super-bright LEDs, illuminating a room for up to eight hours on a full charge, which is sourced by exposing the Ultra’s back solar panel to sunlight for six hours or more. At a cost of less than $10 per unit, the Mandarin Ultra is touted to be the cheapest, quality solar light in the world. It costs a fraction of competing designs because it was designed with the income level of the target customer and the generation of UN accredited carbon credits in mind. "What makes the lights affordable is the generation of carbon credits as the lights are sold and used. We worked with our alliance partner, CarbonSoft (a Standard Bank joint venture) on the complex accreditation program," says Liz Aitken, illumination’s CFO. The governments of Britain, the USA, Japan and the EU have all bought the new lights and supplied them to refugees via the International Organisation for Migration. "We created this light for the billion people who live off the grid and survive on less than a dollar a day. Buying fuel for a kerosene lamp can take a third of their income, the kerosene fumes are polluting, and the lanterns often start fires," Thatcher says. Often they are bursting with enthusiasm for some social entrepreneurship project: making a cheap water-purification system, starting a company that will empower Rwandan women by selling their crafts in boutiques around the world. These people are refreshingly uncynical. Their hip service ethos is setting the moral tone for the age. Idealistic and uplifting, their worldview is spread by enlightened advertising campaigns, from Bennetton years ago to everything Apple has ever done. It’s hard not to feel inspired by all these idealists, but their service religion does have some shortcomings. In the first place, many of these social entrepreneurs think they can evade politics. They have little faith in the political process and believe that real change happens on the ground beneath it. That’s a delusion. You can cram all the nongovernmental organizations you want into a country, but if there is no rule of law and if the ruling class is predatory then your achievements won’t add up to much. Furthermore, important issues always spark disagreement. Unless there is a healthy political process to resolve disputes, the ensuing hatred and conflict will destroy everything the altruists are trying to build. There’s little social progress without political progress. Unfortunately, many of today’s young activists are really good at thinking locally and globally, but not as good at thinking nationally and regionally. Second, the prevailing service religion underestimates the problem of disorder. Many of the activists talk as if the world can be healed if we could only insert more care, compassion and resources into it. History is not kind to this assumption. Most poverty and suffering — whether in a country, a family or a person — flows from disorganization. A stable social order is an artificial accomplishment, the result of an accumulation of habits, hectoring, moral stricture and physical coercion. Once order is dissolved, it takes hard measures to restore it. Yet one rarely hears social entrepreneurs talk about professional policing, honest courts or strict standards of behavior; it’s more uplifting to talk about microloans and sustainable agriculture. In short, there’s only so much good you can do unless you are willing to confront corruption, venality and disorder head-on. So if I could, presumptuously, recommend a reading list to help these activists fill in the gaps in the prevailing service ethos, I’d start with the novels of Dashiell Hammett or Raymond Chandler, or at least the movies based on them. The noir heroes like Sam Spade in “The Maltese Falcon” served as models for a generation of Americans, and they put the focus squarely on venality, corruption and disorder and how you should behave in the face of it. A noir hero is a moral realist. He assumes that everybody is dappled with virtue and vice, especially himself. He makes no social-class distinction and only provisional moral distinctions between the private eyes like himself and the criminals he pursues. The assumption in a Hammett book is that the good guy has a spotty past, does spotty things and that the private eye and the criminal are two sides to the same personality. He (or she — the women in these stories follow the same code) adopts a layered personality. He hardens himself on the outside in order to protect whatever is left of the finer self within. The backwater in Pakistan for which Hasnat Khan will leave Britain couldn’t be further removed from the glamour of his London life and his Kensington Palace liaisons with Princess Diana. But his work there will at last fulfil a dream that he and Diana once shared – to help those in need. As head of cardiac surgery in the first charity-run hospital of its kind in Pakistan, Dr Khan will transform lives and communities. The Abdul Razzaq Medical Trust hospital, in Badlote village, will treat for free rural patients too poor to afford even the transport fares to a hospital in the nearest town, let alone surgery costs. Those patients will include children suffering rheumatic fever, which leaves many with narrowed arteries to the heart which become fatal if untreated. Even for the few families who can afford surgery, waiting lists for treatment at the nearest heart hospital are two years. Most have no choice but to watch their children weaken and die. Every time Dr Khan visits his parents in the nearby town of Jhelum, a queue of patients forms outside the house to seek his help, many of them poor families with desperately ill children. ‘They ring my mother to find out when I am coming home,’ he said. He recalled a nine-year-old boy who came to see him with his father, with arteries so narrowed Dr Khan realised he would not survive long. ‘I said to his father, “I can’t believe he has got to this stage and you haven’t taken him to hospital,” ’ he said. ‘He told me he had taken him to hospital but it was going to cost 250,000 Rupees (£171) for an operation and there was no way he could afford it. ‘So he just left it, knowing the boy was going to die soon. He was such a happy kid. He was still running about and he had no idea what was going on. As he recounted the case, Dr Khan phoned a friend in Jhelum to find out if the boy was still alive. An hour later, the call came back with the news that first the boy and then his father had died. The hospital where Dr Khan’s heart unit will be based is the first charitable cardiology unit in Pakistan. He is setting it up with fellow cardiologist Dr Azhar Kayani, director of medicine for the Pakistan Armed Forces and the Pakistani president’s personal physician. Dr Kayani, who grew up in Badlote and studied with Dr Khan in Lahore, said the hospital would cost the equivalent of £1 million and should open before the end of the year. It is named after his father. Volunteers from Basildon Hospital in Essex, where Dr Khan works, are helping the fundraising drive for the unit and will help train doctors and nurses. They have also helped find donated equipment from other NHS hospitals. Describing the life that awaits him in Pakistan, he said: ‘If you look out from the hospital you see open countryside with cows and camels. There are no taxis or cars or buses. People walk for miles and miles just to see someone. ‘It is very simple to live here. My [family] home is just down the road so I will have no rent to pay. ‘This unit is a dream come true. It is very satisfying. Of course I find my work in England satisfying but my work there is also routine. To come here and to build something from scratch is very different.’..
Pakistan-based startup Transparent Hands is a crowdfunding platform which looks to address the problem of a lack of access to quality healthcare in the nation. Pakistan has a population of approximately 200 million people, yet its health indicators are abysmal. The government allocates only 0.67% of GDP on the healthcare sector; so the country’s public health infrastructure is almost non-existent. While patients can receive access to quality healthcare facilities, it is very expensive. With a reported 58.7 million citizens living under the poverty line, this is simply not possible for a vast segment of the populace. Transparent Hands, which was incubated at Lahore-based Plan9, launched operations in 2014 with the objective of bringing transparency to charitable donations in Pakistan. Founder Rameeza Moin says that the venture is entirely not-for-profit and came about after a thorough analysis of the existing healthcare segment in the country. “There are many potential donors across the world who want to contribute, but they don’t know where and when to send their money or whether their donations will be utilized in a proper way. This is the main issue we’re trying to overcome,” she adds. Transparency is at the core of the startup’s processes. Team members visit rural and semi-urban areas to find patients in need of critical medical care. Their cases are verified, both in terms of health and finances. The startup currently only works with patients who require surgery. Since its launch, Transparent Hands has facilitated over 200 surgeries and has partner hospitals in four cities. Its next step is to expand into other major urban centers, as well as focus on other areas of service delivery – such as education.